I had a busy, productive and fun weekend. It had its frustrating moments, though. On Saturday, I taught a class at The Quilt Merchant and spent the day with lovely ladies who made the day fun. It's always a pleasure to teach when you have a good group. It's nice to take a class with a fun energetic group, too. On Sunday, I wasn't quite sure how I was going to spend the day. Then, my dear, sweet, lovely daughter offered to cook dinner. YES! She's cooking.....she gets to choose what to cook. She chose a Rachel Ray recipe - Cheeseburger Meatloaf. Hhmmmm. Not one I can say I'd ever chose myself, but let's give it a whirl. It was pretty good. Think cheeseburger without the bun....pickles and all. I digress. Being relieved of cooking duties I had more choices as to what to do with my time. I decided to sew for a few hours on something I've been working on just for me. This is a small quilt and I have the perfect place to display it. In a year, I've made one block. Now wait.......let me explain. In my previous blog post, I mentioned that I adore small blocks. These are very small blocks. Very small scrappy blocks. I made one block and realized that I needed to acquire scraps. So, for many months now, as I cut any quilt or new fabric arrivals, I've been cutting 1.25 inch strips. LOTS of strips.....to make these cuties. These Courthouse Step blocks finish to 4 inches. Each log is a 1/4 inch. Rest assured....paper pieced! Each block takes me an hour to make, so this represents 4 hours work. These are the last four blocks I made. This is the first block I made yesterday. I love how the fabrics look. Notice something off? Something not quite right? Yes.....the plaid fabric on the left side is a bit wider than the right. I skipped a rotation on the left side. ARGH!!!!! GRRRRRR!!!!! There's no going back. No ripping out. An hour wasted. I can't use it because the plaid on the right will always be 1/2 inch while the others are 1/4 inch. I can't bring myself to throw it away...it's kinda cute. Maybe I'll make a pincushion out of it. For now it's an orphan. Don't you just hate when you do things like this???? We all have these moments and I just thought I'd share mine with you. Well....I'll keep cutting strips and when I have a few found hours, I'll stitch a couple more blocks. I hope I get it done before I decide to redecorate the room! On another note....I am still working on making the quilt using these blocks. I'm hoping to be done tomorrow. Its taken a bit longer than I thought (don't they all!) I don't mean to tease you, but when I do finish, I'll be keeping it a secret a bit longer. I'll reveal the finished quilt around the beginning of April. I've made some extra blocks to make a smaller quilt and promised to share the pattern with you and I will do that very soon....so hang in there....don't give up on me just yet! 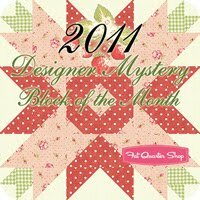 Oh...and don't forget to take a look at the 2011 Designer Mystery Block of the Month from Fat Quarter Shop.com!!! It's been on their Top Seller List ever since the announcement! There's still time, it's soooo cute and you don't want to miss out! Here's hoping you have a week free of Argh and Grrrr moments! Today, I enjoyed an hour of quilting recess....the kind of recess we enjoyed when we were in grammer school. You know, the hour of play time to get away from your school work and do something fun. Now... I have to qualify that with an explaination 'cause the work I do is very fun....but this is a bit different. 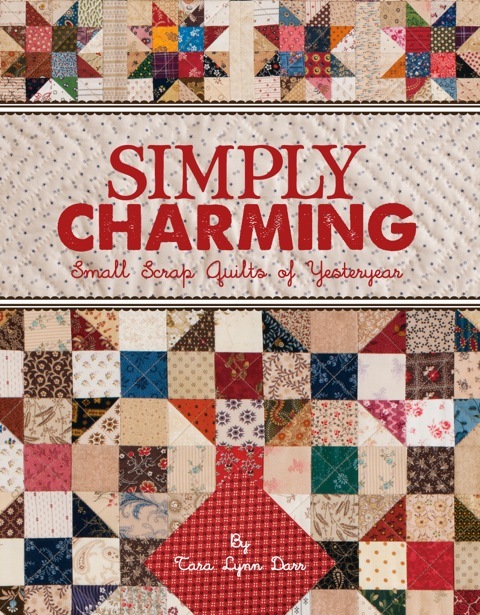 There are quilts that nudge and nag me.....quilts I want to make....no doubt hundreds of them! I have oodles of patterns and kits all patiently waiting for me. The kit or pattern I just bought is the one I'm most excited to make....until the next one comes along. Sound familar? Uh huh! But there are those special quilts that stay with you....no forgetting about them 'cause you just have to make them. Well, I've begun to reorganize my scrap bins (this is yet another stage in the ongoing house renovation project!) and as I've been working thru the bins and piles trying to organize them, I've also been pulling fabrics for ongoing scrappy projects. Some of these fabrics haven't seen the light of day in many years....but actually, that's nice because it's like seeing an old friend. As I sort, I'm thinking.....oh....that will make a great basket (for the Blackbird Designs basket quilt I'm working on) and when I come across a narrow strip, I grab that one for a Courthouse Steps I'm working on....you get the idea. Well....getting back to that quilt that keeps on nudging me. When I was sorting, I started to make a pile for a Thimbles quilt I've been dying to make. I just keep thinking about it. It all started with this book. It's one of my all time favorites! 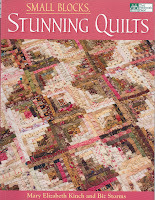 It combines small blocks, which I am crazy about, and stunning scrap quilts. Guess what's in there?? 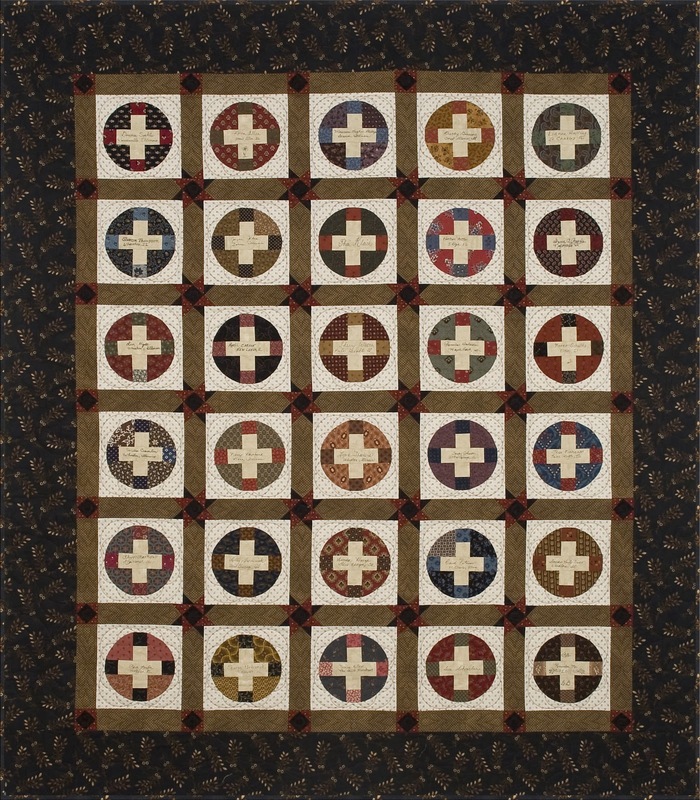 This wonderful Thimble quilt called Rocky Mountain Thimbles. It has 6,536 Thimbles in there. Hhmmmm.....I'll aspire to this...but isn't it wonderful? Ever since I bought the book, this quilt has tugged at me. Then....along came Tara Darr's new book, Simply Charming. (See my post of January 25th to read more about Tara's book!). Yup......another Thimbles quilt! I love it.....I covet it....I want it! More nudging and nagging. Hhmmm...this time, I only need 380 Thimbles. Very doable. So, yesterday, after collecting a pile of scraps, I made my template and traced a bunch of Thimbles. Last night, while watching TV, I cut them. This morning.....I took an hour of recess from work to try my hand at making one row from the pattern in Tara's book. Ta Da! It was soooo fun! I loved trying my hand at sewing something new....something I've never done before. Not too bad for my first try! I'm gonna love putting this little quilt together. It won't be done anytime soon because I don't have anywhere near the 380 Thimbles cut out and ready to go, but that's ok. I don't have all of my basket fabrics together either, but as I work on other projects and sort thru my scraps, I add to the pile. And...I'll add to my Thimble pile, too. I like having long term projects to work on. If I trace a bunch, I can cut them out while talking on the phone or watching TV. It's also great to have a project that uses smaller scraps because you can make use of that last little bit instead of throwing it away. These scrap quilts feel like freebies, too, don't they? And....as Tara says, even the ugliest of fabrics look great when they're cut small and added to a scrap quilt. 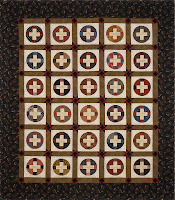 Reproduction quilts need those "uglies" as they give them more of an authentic feel. One more thing I wanted to share with you. Having the right tools for the job makes any job easier, right? Well, recently, my girlfriends told me about the scissors you see on the left. They're called Cutter Bee scissors. They are very light weight, easy to handle and sharp, sharp, sharp. Best of all, they're only $5.99 at JoAnn's! You can find them in the scrapbooking dept. (They may be available elsewhere, but that's where I got mine.) Between the Fiskar's and Cutter Bee's my hands were never sore from cutting my Thimbles. So....take my advice and take a little quilting recess. Make a block you've been dying to try. Start a new project and quiet those nagging urges. If anyone gives you grief, just say Pam said I just have to do it! Let's Talk About Making Do! As creator of the Prairie Women's Sewing Circle, I spend a lot of time reading and thinking about life in the nineteenth century. The phrase shown above can be applied to many aspects of the lifestyle of those who lived in America long ago (early American life).... and not so long ago (WWI & II for instance). It has a lot to teach us in today's world too, but it's the impact this lifestyle had on antique quilts that so intrigues me. As many of you know, I am passionate about Make-Do quilts! (Truth be told, that's an under statement.) I'm on a mission to educate the quilting public about Making-do, to share my love affair for the old Make-do quilts, and encourage you to "make-do" as well. But first, you have to know what a Make-do quilt is! There is a difference between a scrappy quilt and a Make-Do quilt. A scrappy quilt can have Make-Do elements in it, but for it to truly be a Make-do quilt you should be able to spot a theme within the quilt's design. The theme indicates there was an ordered plan to the quilt in color, fabric(s), blocks etc, and for many reasons, the quiltmaker had to deviate from the theme and "make-do" with what fabric she had available to finish the quilt. 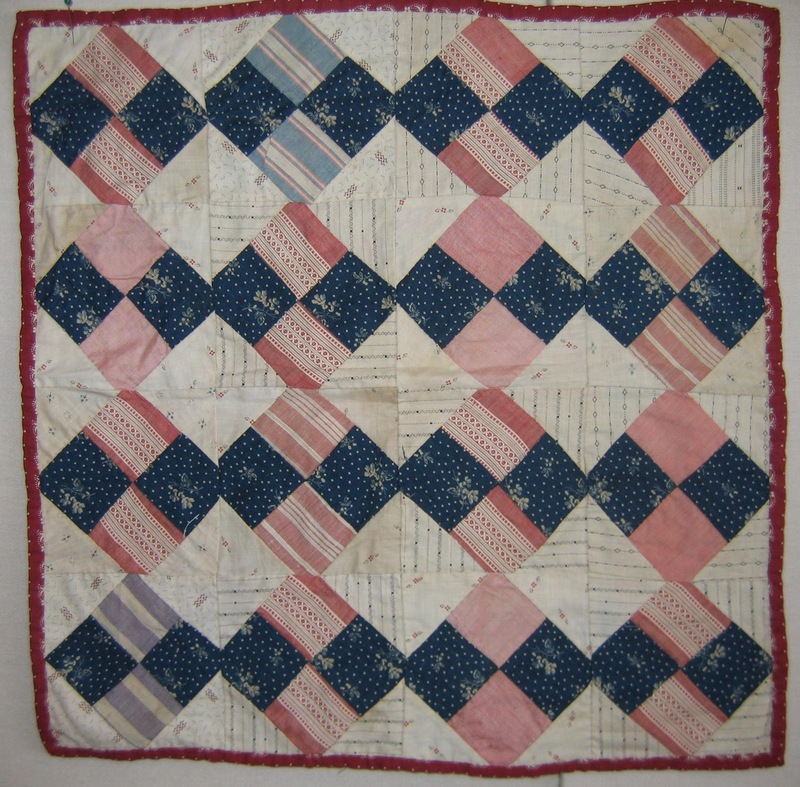 As we look at this antique doll quilt, we can easily spot the theme.... simple Four Patch blocks made of dark blue and pink patches. Yes, it's also a scrappy quilt using many fabrics, but you do see the theme in the color. The two Make-do blocks are also easy to spot. I'm fairly certain that the quiltmaker would have preferred to make all of her Four Patches with the dark blue and pink fabrics, but she substituted......Made-do....with the light blue in place of the pink within two blocks. What about the red binding? I love the red binding! If you were making this pink and blue quilt today would you have chosen red fabric for the binding? Probably not....because we are so used to coordinating everything...but the red binding is wonderful on this quilt. That begs the question....was the binding a Make-Do or was it her choice? Remembering that beauty is in the eye of the beholder....often we can only speculate about Making-do. Why am I so passionate about Make-Do quilts? The reason is very simple. As quilters, we love a quilt pattern or block...it stirs our creativity and we want to make a quilt. We plan...we choose just the right fabrics....we labor giving our time and talents....we know every fiber and stitch in that quilt and work to make it the best it can be. What if we then realize that we can't finish the quilt as we had hoped and planned? Sometimes, in order to finish the quilt, our quilting ancestors had to make substitutions and use what was available to her either with her own scraps or those from a fellow quilter. She "make-do" with what she had. Was she disappointed? I think yes, because she had a theme...she wanted the quilt to turn out a certain way....but on the other hand, they were quite used to making-do in all aspects of their lives. Nonetheless, she completed the quilt and no doubt loved it. It kept her family warm...it still held her love in every stitch. I think all of these qualities are wrapped up in the old Make-Do quilts and that's why they are so endearing to me. I find most every antique Make-do quilt charming although some are...well....homely. Ok...those homely quilts kept their family warm too, but I don't necessarily want to make one just like it! However, I do love adding Make-do blocks into my quilts, and by doing so, I honor the women who didn't have all of the choices we have today, but who worked very hard to create beauty when they truly didn't have much. I hope that you will come to love and appreciate the art of Making-Do as I have, and remember, if you create Make-Do blocks in your next quilt, you'll be honoring our American quilting heritage. I'll be writing and showing you lots more about Making-Do in the future. Remember....I'm on a mission! 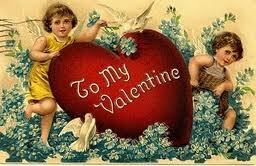 Just a quick note to wish you all a heartfelt Valentine's Day. I hope all of you will spend the day with those you love! My family will be here and there later, so we had breakfast together this morning which was nice. My friend Terry sent me a link to a fun animated quilt video I thought you might enjoy. Drum roll please........and the winner is...... Comment #5.....Jill from Pennsylvania! Congratulations, Jill! Please email me and I'll get the warm and cozy afghan in the mail to you mucho pronto. I want to thank all of you who took the time to comment and tell me about your winter weather, where you live, and about how much you quilt. I thoroughly enjoyed reading every one of your comments so very much. Thank you, thank you! Yesterday, I had the best time. I spent the day at The Quilt Merchant teaching both Journey 1 and Journey 2 of the PWSC club. What a wonderful group of ladies (now officially Prairie Women!) in both sessions of the club. We talked a lot about life in the 1800's and Make-Do quilts, had some terrific show-n-tell, made some Yo-yos, and had lively discussions. Makes my heart sing 'cause I get to do what I love with so many kindred spirits. Oh....and lets not forget about the bolts upon bolts of yummy CW reproduction fabrics! Tomorrow, I will get back to work on the blocks I showed you in my last post. In a few days, I will post a bit about Make-Do blocks, so stay tuned, stay warm, and keep your sewing machines humming! Stitchin' Away......and a new Contest!!! You may recall last week Wednesday...during the blizzard... I showed you a photo of some yummy fabrics I was gonna start to play with. Well.....here's what I've been up to. Isn't this a cute block? Simple, fun and fast but cute as can be. I love the combo of fabrics. The assorted shirtings, the bubblegum pinks, reds, blacks and blues. Makes my quilty heart sing. Perhaps I'm easily amused.....I don't know...but why question it? 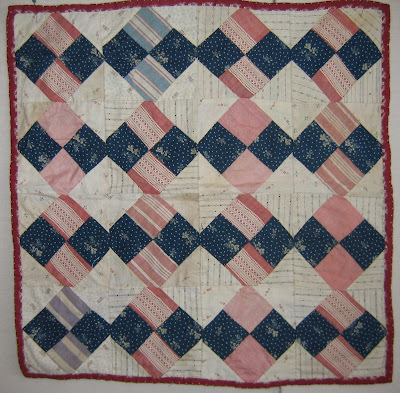 I thought the red and blue blocks would make a mighty fine patriotic quilt, too! What do you think? This quilt is for a special event I'm participating in over the summer....July I think. So, I won't be able to show you the whole quilt when it's done....not just yet anyway, but I plan on making extra blocks to make a small bonus quilt. And, when that one is finished, I will definitely post photos and instructions for you...in case you'd like to make one for yourself. I have to set this project aside until next week. Tonight (Wed), I'll be visiting the Pieces 'N Patches Quilt Guild in Steger, IL....so if you're in the area, please stop on by! We'll be at the Steger Community Center. Then...I'll be getting ready for Saturday when I will resume teaching my Prairie Women's Sewing Circle club ~ both Journey 1 and Journey 2 ~ at The Quilt Merchant in Winfield, IL. I can hardly wait! 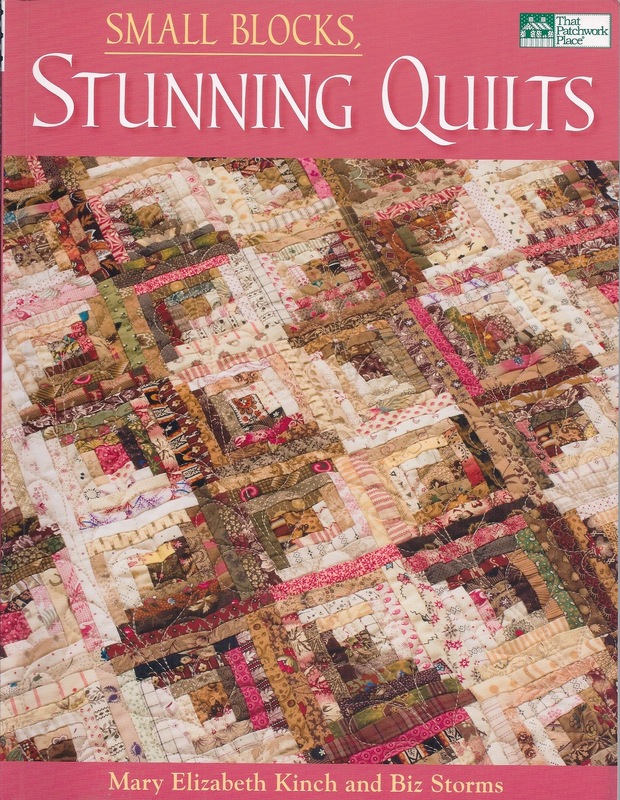 I love, love, love teaching, especially the PWSC club because it combines my favorite pastimes ~ American life in the 1800's and Make-Do quilts. It's wonderful being with all of the ladies whom love the same things. We're kindred spirits and we have the best time....great discussions, spectacular show-n-tell with lots of laughter. You know....there's always room for one more and you're welcome to join the fun! This has been one of the snowiest and coldest winters on record here in the Chicago area. Not a problem for us quilters as we have loads of cozy quilts to snuggle under. My grandma was an avid crocheter and I have several wonderful afghans that she made for me. Not long ago, I found this adorable afghan from Moda Home and had to buy it. Well...I actually bought two....one for me and one to give away! If you'd like to win this afghan, please leave me a comment and tell me what the weather is like right now where you live, what's your favorite season, and do you quilt all year long or does the weather make it uncomfortable to quilt? Leave your comment before midnight on Saturday, Feb 12th and I'll announce the winner on Sunday. Enjoy your day! P.S.....just wanted to encourage you all to participate in the contest no matter where in the world you live! The contest is open to everyone...no worries! The snowfall ended, the sun came out and we got our first look at what Mother Nature bestowed on us. This is my hubby, Ed. To give you an idea of how much snow there was...he is 6'3" tall. When we opened the overhead garage doors....this is what we saw. Where to start? Let's try the side door. Hmmm. These drifts were up against the side garage door. He started to shovel there, but there's just too much. Eventually, he dug us out along with the help of our neighbors. We are blessed with the very best neighbors anyone could wish for! Now we're experiencing the deep freeze. Oh well....as we say in Chicago....if you don't like the weather, wait 5 minutes. I've been starching and cutting the fabric I showed you the other day and will begin piecing today....yippee! On Monday, I should have some blocks to show you. Oh....and a new contest to tell you about...so have a great weekend and stop by again!! As you undoubtedly heard, the Chicagoland area where I live had (and still is having) a major winter snow storm....Blizzard to be exact. The "B" word isn't something that's used here all that often. We get snow, yes, but not this much snow﻿!! We knew it was coming for many days. Many, many people went to the grocery store (including me) for what is commonly called "French Toast" shopping, which means you stock up on eggs, milk and bread. Well....and other goodies and essentials..like lots of gasoline for the snowblower! We're all set....we're prepared. I knew I wanted to share this event with all of you, especially those whom never experience snow, so I took a series of photos. This is the view out of my sewing room window which looks out at a part of my backyard. This was taken yesterday morning about 9 AM before the snow arrived. Notice the little flag pole and the angel statue. ﻿At 1:30 PM, the snow has arrived, carried on winds that were blowing a constant 40mph, gusting to up to 60+ miles per hour. The many people predicting the weather here in Chicago forecast at least 12 to 18 inches of snow over the next 24 hours. Their computer models say totals could reach 24 inches or more. Lots of hype....but would it really be that much? Here's how it turned out! We have about 19 inches of snow here with some amazing drifts. Notice that the flag and angel are covered, but there's nothing in front of our barn. Mother nature sure can do interesting things with snow drifts! When you're a kid, all you wish for all winter long is a snow day off of school. Well, when you're a big kid, a snow day is still a mighty fun thing. Our son, Ryan, is stuck at the firehouse and the rest of us won't be leaving our house anytime soon, so what's a quilter to do? Fire up the sewing machine and the iron, of course! knowing I've got a lot of French Toast I can eat. Teehee! Hope you're safe and warm wherever you are!